For most of us spring is a busy season. Mix that with a touch of laziness and sprinkle some procrastination on top and you have an un-updated blog. It’s certainly time for an update! 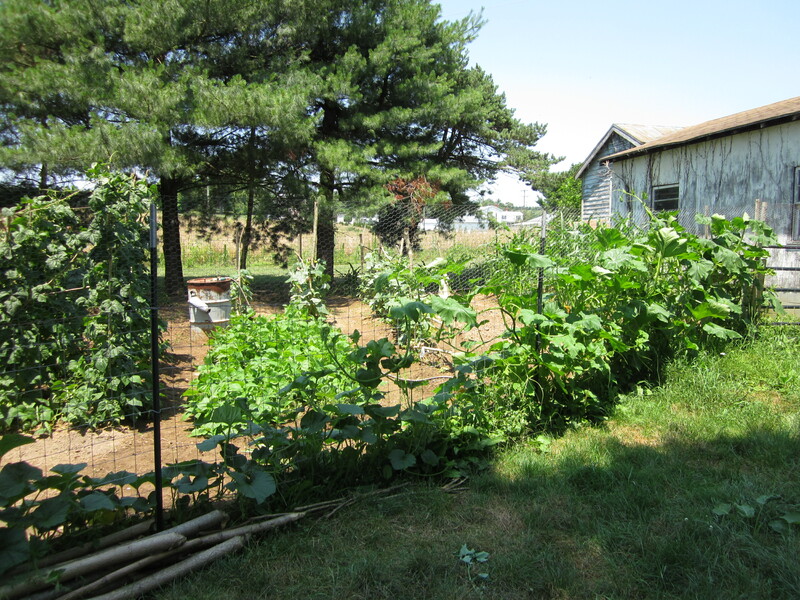 Our garden was put in with the aid of our goats and chickens, enriched by a couple hundred pounds of rabbit manure, dug and turned by hand twice, and tilled by an almost-running free rototiller. Months later it’s unrecognizable as the sun-baked, wind-blasted wasteland it used to be. This is after the garden was tilled and raked into beds. Bethany had a detailed plan of what she wanted to plant in each bed and how much space it would take. 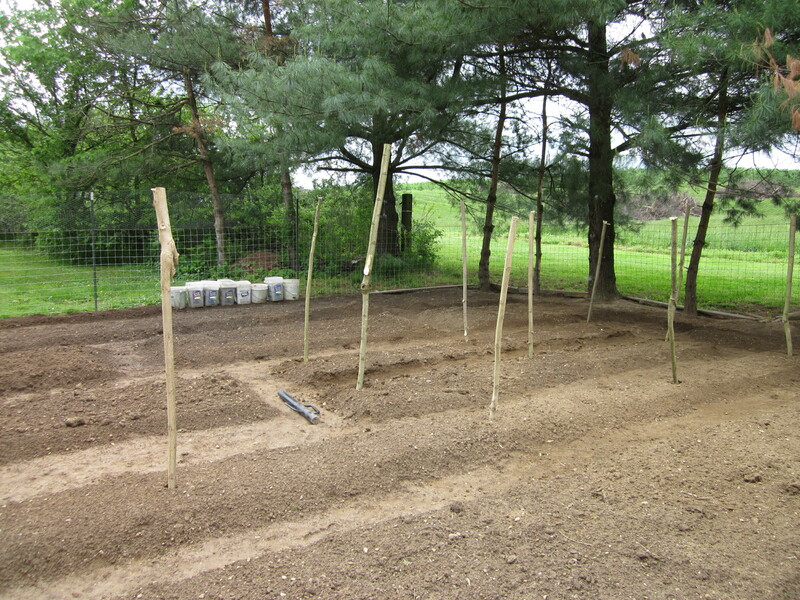 The stakes are sumac trees that I drove in for cucumber trellises. Our cucumbers quickly outgrew the indoor starter pots and had to be moved outside. In the future we’ll try to start our tomatoes earlier and our cucumbers later. 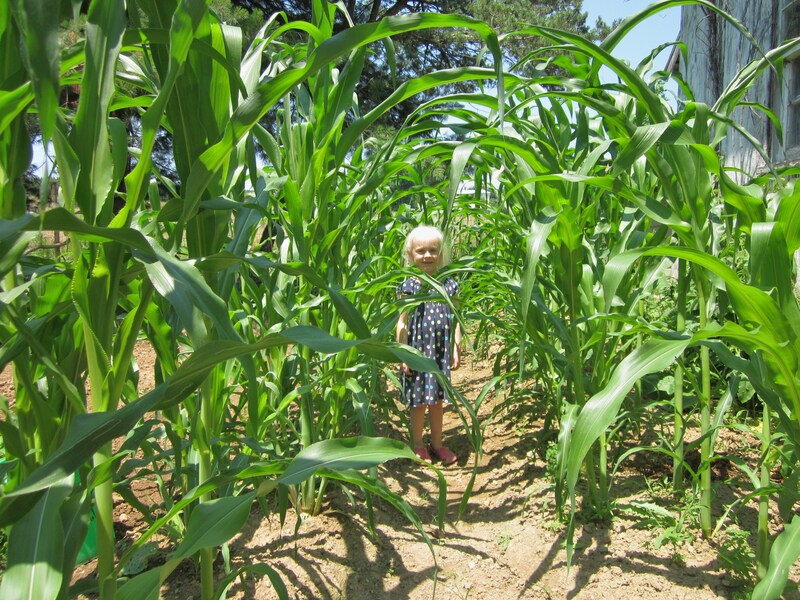 A month and a half later the corn is twice as tall as Bella. It took a long time to come up after planting so we were a little concerned, but once it started it grew like crazy. We finally have little green tomatoes on most of the 20+ tomato plants. They’re much denser than any we’ve grown before so in the future we’ll probably plant them in single rows instead of double. 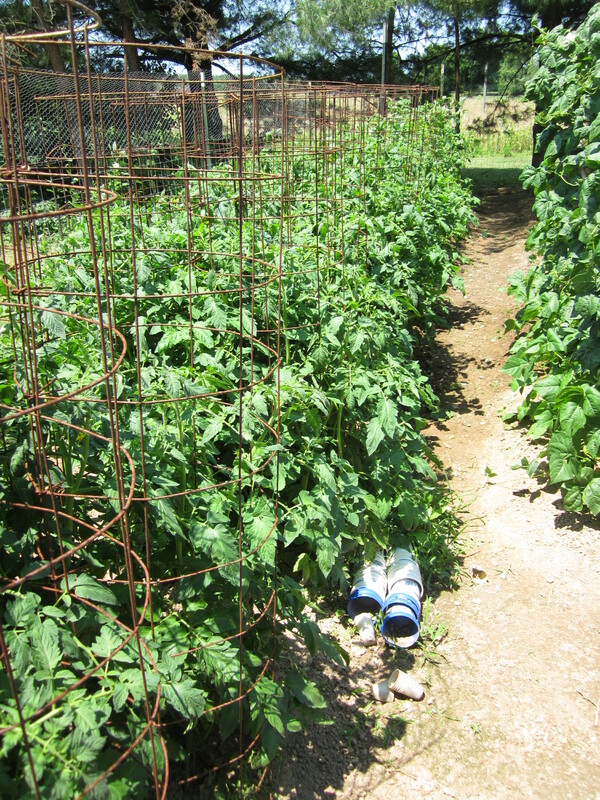 It might be tough to pick all the tomatoes from these. The pole beans seem to grow a foot every day. They would be 10-12 feet tall if the poles were tall enough to support them. Instead they’re growing horizontally when they reach the tops of the poles. To the right of the pole beans, the black beans are doing very well. They’re a bush type bean but they have a tendency to fall over so next year we’ll probably tie them to stakes. Our lima beans are behind the other beans. We planted them too early so they didn’t come up well. We’ll probably get a few limas but not many. 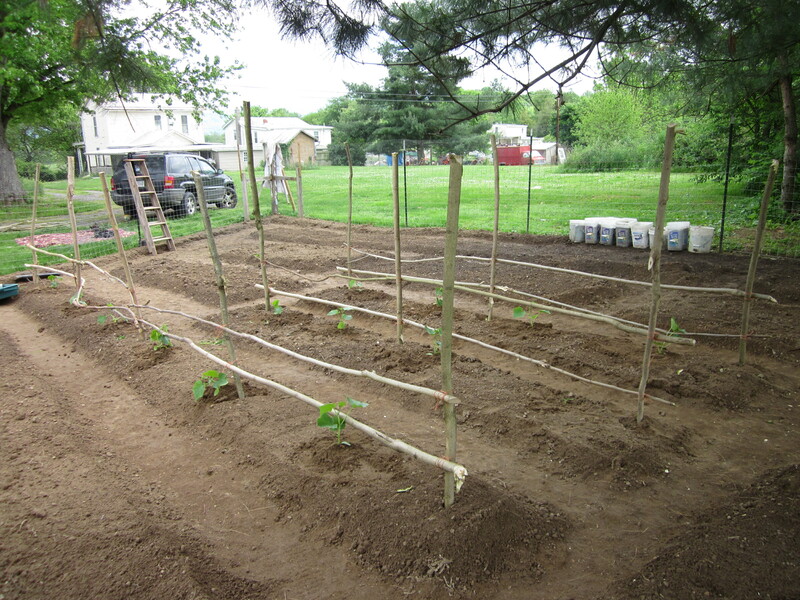 We planted watermelon, cantaloupe, pineapple melons, and a couple types of squash along the perimeter fence. It took a little training to get it to climb but it’s doing well now. The biggest failures in the garden are the cucumbers and peppers. We’ve gotten almost 40 cucumbers already but all the plants have bacterial wilt and are looking pretty poor. The plants are still growing and producing some but who knows how long that will last. The peppers, for one reason or another, never got planted. The initial attempt didn’t germinate, and the second attempt never really happened. We have about 4 plants instead of the 20-30 we had planned. All in all things are going well for our first real garden. It’s been a learning experience and there are definitely things we’ll do differently next year, but for now we’re happy with it. 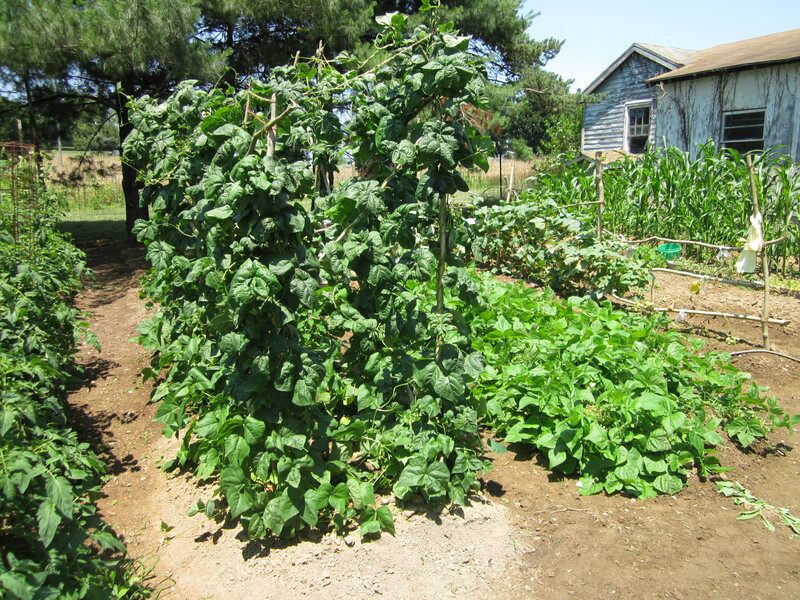 This entry was posted in Gardening and tagged cucumber bacterial wilt, garden, gardening, produce. Bookmark the permalink.